Ben Bikin is the crown jewel in Sparta’s crown as the “Bicycling Capital of America.” Sparta is the northern terminus of the Elroy-Sparta Trail, the first rail-to-trail project in the United States. Other major trails, including the La Crosse River Trail, converge here. The city celebrates bicycling throughout the year, although summer and fall is clearly preferred. Ben Bikin stands 32 feet high atop an 1890s-era Penny Farthing bicycle. A local company, F.A.S.T. (Fiberglass, Animals, Shapes, and Trademarks) Corp., created the statue, where he’s been stationary in his present location in 1995. He is considered the World’s Largest Bicyclist. The statue of Ben inspired the mayor of Port Byron, Illinois to commission FAST Corp to build a similar statue for their town. This replica in Illinois was named Will B. Rollin’ and it inspired a bicycle ride between the two towns. Now, the annual Will To Ben Bike Tour gives riders the opportunity to cover over 300 miles of beautiful roadways from Will B. Rollin’ in Port Byron to Ben Bikin in Sparta. Will To Ben runs annually in early October, when fall colors are often at or close to peak. Ben Bikin even has his own Facebook page. 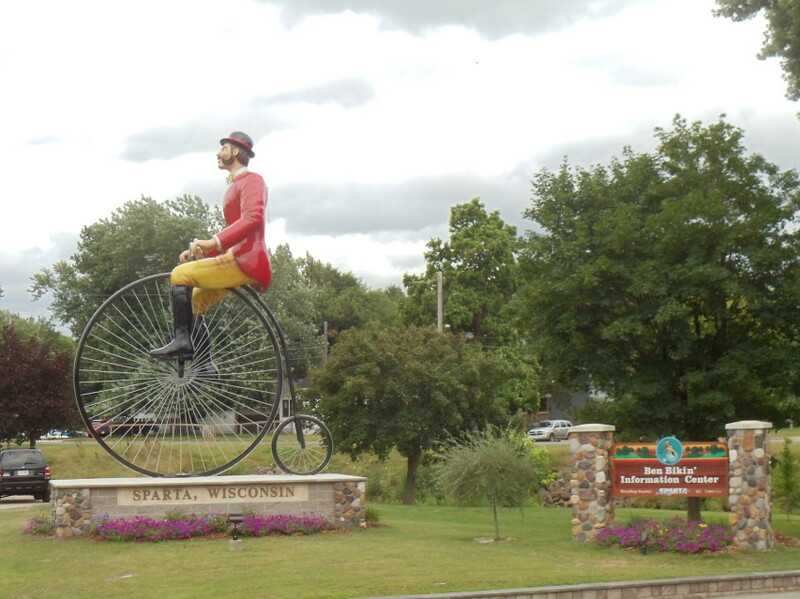 You’ll find him perched on his bike at the corner of Highway 16/71 (Wisconsin Street) and Water, on the edge of downtown Sparta. Sparta is also home to the Deke Slayton Memorial & Bicycle Museum and has a lot of small town charm. Highways 16, 21, 27, and 71 reach Sparta, as well as I-90 via Exits 25 and 28. Tomah is about 15 miles to the east and La Crosse is about 25 miles to the west-southwest. The city is in the midst of Wisconsin’s beautiful Driftless Area and features abrupt hills and attractive topography.